If there is one overarching lesson to be learned from the 2014 Quebec election campaign, it is this: Do not overestimate voters’ appetite for revolutionary change, or their vulnerability to populist demagoguery. From the fervid expressions of Quebec nationalism that often were emitted from Pauline Marois’ government — and which found a muted echo in the me-too nationalism of the Liberals and Coalition Avenir Québec — one would think that the province were burbling with disaffection. Prime Minister Stephen Harper is unpopular in Quebec and Québécois politicians seem to delight in torquing every national issue into a source of regional umbrage. And yet, when one of Quebec’s most successful businessmen raised his fist on March 9 and said, forthrightly, that he wanted to help the Parti Québécois create a new country, the PQ sunk like a stone in the polls. Quebec’s academics and artists always have been drawn to the romantic overtones associated with the notion of independence. But businessmen know that a referendum would destabilize the market. Homeowners know that it could sink their property values. And indeed anyone who can count knows what would happen to Quebec’s balance sheet if the $16-billion that the rest of the country sends it every year were suddenly cut off. The PQ’s “secularism charter” is another issue on which populist agitation — whipped up by PQ-friendly voices in the tabloid media — failed to translate into actual votes. Before this election was called, polls showed that the charter was popular (in the abstract, at least) with most Quebecers; indeed, it was the issue that seemed to have put Ms. Marois within striking distance of a majority mandate. But when the actual campaign began, and a PQ candidate admitted in a debate that some people could actually lose their jobs over their choice of religious headgear or jewellery, a lot of voters woke up to how absurdly punitive such a rule really would be in practice. Even on the issue of language, the PQ seems to have overreached. Many Québécois nationalists are worried about the fate of French, given Quebec’s status as a linguistic bastion within anglo North America. The PQ count on this, regularly proposing new restrictions on English as part of their effort to mobilize the populace, and accusing their opponents of selling out francophones. But when the PQ introduced new restrictions on English in 2013, as part of Bill 14, much of corporate Quebec balked. In late March, as her campaign was floundering, Ms. Marois vowed to reintroduce most of the measures in Bill 14. But the issue provided her with little traction. When a PQ candidate admitted that some people could actually lose their jobs over their choice of religious headgear or jewellery, a lot of voters woke up to how absurdly punitive such a rule really would be in practice. On federalism, the “reasonable accommodation” of immigrants and language, Quebecers decided that they didn’t need any radical change to the status quo. 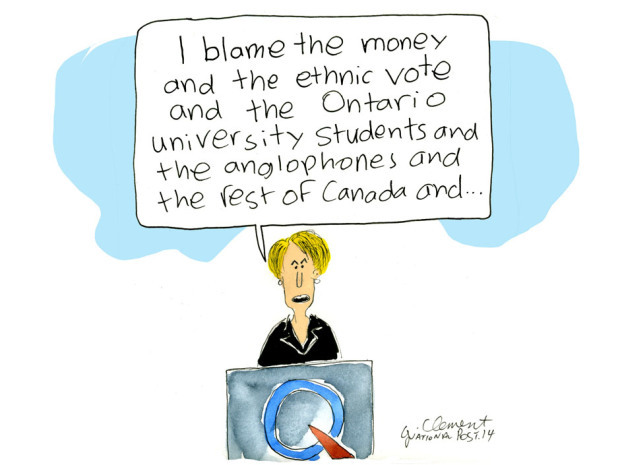 And not a few them, no doubt, were alarmed at the increasingly shrill and absurd efforts by PQ members and supporters to convince them that they were under threat by Muslim swimming-pool users or Ontario-born McGill University students. Revolutionaries can afford to look angry, and even intolerant. But they cannot afford to look ridiculous. And this is what the PQ became in the last few weeks of this campaign. As for Quebec Liberal leader Philippe Couillard, he was criticized throughout it all for his somewhat flat campaigning style and his lack of any sort of exciting vision for the province. But given the overheated political atmosphere created by the PQ’s various failed gambits, Mr. Couillard’s sober style is arguably what the province needs most right now. Quebec is a hugely indebted province: Tough choices will be required when the Liberals submit their first budget. The province also has enormous infrastructure problems, as every visitor quickly learns as soon as he puts rubber to road anywhere in Quebec. And it will take many years for the province to be rid of the legacy of corruption laid bare by France Charboneau’s Commission of Inquiry on the Awarding and Management of Public Contracts in the Construction Industry. These should be Mr. Couillard’s primary concerns upon taking office. As for the secularism charter, Bill 14, and Mr. Péladeau’s separatist daydreams, they properly belong in history’s dustbin. During her 18 months in office, Ms. Marois’ main objective was to divide Quebecers and agitate for the break-up of Canada. Mr. Couillard could do a lot of good as premier simply by breaking cleanly from his predecessor’s parochialism. We congratulate him on his victory, and hope that he succeeds in making Quebec a wealthier, more globalized, more transparent and more tolerant place.